The Second World War produced some incredible heroes, men and women, who in he face of incredible odds, continued to carry out their duties, often going beyond those expected of anyone. One such man was Arthur Louis Aaron, of 218 Squadron, RAF Downham Market, Norfolk. Aaron, born 5th March, 1922, in Leeds, who at the time that war was declared, was training to become an architect at Leeds School of Architecture. On joining the Royal Air Force on December 15th, 1941, he was sent, via Canada, to No.1 British Flying Training School (B.F.T.S.) at Terrell, Texas, where he completed his initial flying training. Aaron like the other recruits would pass through ten weeks of biplane flying, moving onto monoplane aircraft at which point, if successful, they would receive their wings. Returning back home also via Canada, he was hoping to fly fighters but was disappointed when he was posted to bomber training, and was sent to 6 Advanced Flying Unit at Little Rissington. After further training, he was sent on to 1657 Heavy Conversion Unit (Stradishall) flying Stirling MKIs, and then on 17th April 1943, he was posted to his first operational flying unit, 218 (Gold Coast) Squadron, at RAF Downham Market. Whilst here at Downham Market, Aaron continued flying Short Stirling bombers, the large heavy bomber that proved to be both vulnerable to fighters and poor performing. Due to high losses it was eventually pulled out of front line bombing duties, and used for mine laying, glider towing and parachute operations. Aaron’s first mission would be the very next day after arriving at Downham Market. He, and his crew, would fly a ‘gardening’ mission laying mines off Biaritz, after which he would be sent on more heavily defended targets within German occupied Europe and Germany itself. At 21:35 on the night of August 12 – 13th 1943, Flt. Sgt. Aaron and his crew: Sgt. M. M. Mitchem (Flt Eng. ); Sgt. 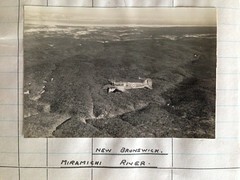 A. C. Brennan (RCAF) (Nav. ); Flt. Sgt. A. W. Larden (RCAF) (Bomb Aim. ); Sgt. T. Guy (Wop/AG); Sgt. J. Richmond (M.U. Gunner) and Sgt. 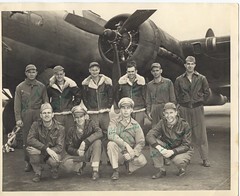 T. M. McCabe (R. Gunner), all took off from Downham Market on their second mission of August to attack Turin, a night that featured several attacks on Italian targets. This would be Aaron’s 20th and final mission, three as co-pilot and seventeen as pilot. He was a man known for his courage and bravery, only 12 days earlier he had struggled with his aircraft whilst his crew bravely fought fires that had broken out in the fuselage after being hit by incendiaries from aircraft flying above. Using his skill and judgement, he managed to evade both flak and searchlights by corkscrewing his aircraft whilst the crew members put out the fire that resulted from the accident. For his action on this day, he would be awarded the D.F.M.,*1 one of the highest possible awards for non-commissioned officers in the Royal Air Force, but this, like his V.C., would only come posthumously after his death on 13th August 1943. 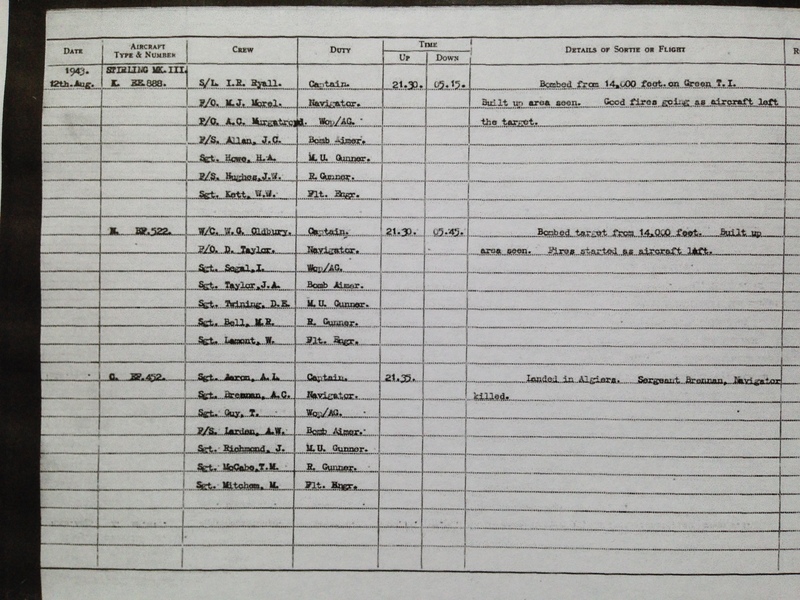 That night, two of the thirteen 218 Sqn aircraft from RAF Downham Market in Norfolk, would be posted ‘missing’; Stirling HA-Y ‘MZ 263’ piloted by F/O J. McMallister, and that of 21-year-old Arthur Aaron – Stirling III ‘EF452’ HA-O . 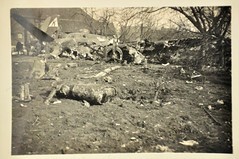 Whilst in the bomber stream heading toward Turin, the aircraft was hit by gunfire from another aircraft. The navigator, (Sgt. Brennan s/n R/117605) was killed, Sgt. Mitchem and Flt. Sgt. Larden were both injured. 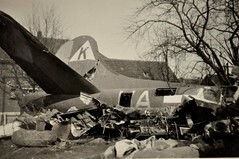 The aircraft, now badly damaged, had been hit in three of the engines resulting in one of them being put out of action. Both front and rear turrets were immobilised, various control lines were broken and the windscreen was shattered. During the attack, Aaron received devastating blows to his face, his jaw being broken and quantities of flesh being blown away. A further bullet struck him in the chest, puncturing his lung. Now in great pain and severely injured, Aaron fell against the control column forcing the aircraft into a dive. After the Flight Engineer regained control, a course was set for North Africa, Aaron was moved to the rear of the plane where he was treated. He remained here for only a short time, insisting on returning to the cockpit where he was placed with his feet on the rudder bars. Wanting to take over, he had simply insufficient strength, and was persuaded to assist rather than fly. He wrote notes with his left hand, guiding the crew toward the airfield at Bone, in Algiers. After four failed attempts at landing, the bomb-aimer finally managed to get the aircraft down, low on fuel and with its undercarriage still raised. At 15:00 on August 13th 1943, Arthur Aaron finally lost his determined battle to survive and died from his terrible injuries. He had fought on, overcoming severe pain and injury to guide his crewmen back to safety. Flt. Sgt. Aaron was buried alongside Sgt. Brennan in Bone War Cemetery, in Algeria. For their action Flt. Sgt. Larden received the C.G.M., and Sgt Mitcham and Sgt. Guy, both a D.F.M. Arthur Aaron was awarded not only his D.F.M. from his previous mission, but the V.C., the highest honour for military personnel. His V.C. was announced in the London Gazette on November 5th, 1943*3. Air Ministry, 5th November, 1943. 1458181 Acting Flight Sergeant Arthur Louis Aaron, D.F.M., Royal Air Force Volunteer Reserve, No. 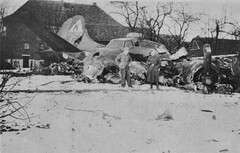 218 Squadron (deceased). On the night of 12 August 1943, Flight Sergeant Aaron was captain and pilot of a Stirling aircraft detailed to attack Turin. When approaching to attack, the bomber received devastating bursts of fire from an enemy fighter. 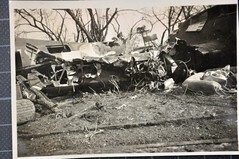 Three engines were hit, the windscreen shattered, the front and rear turrets put out of action and the elevator control damaged, causing the aircraft to become unstable and difficult to control. The navigator was killed and other members of the crew were wounded. A bullet struck Flight Sergeant Aaron in the face, breaking his jaw and tearing away part of his face. He was also wounded in the lung and his right arm was rendered useless. As he fell forward over the control column, the aircraft dived several thousand feet. Control was regained by the flight engineer at 3,000 feet. 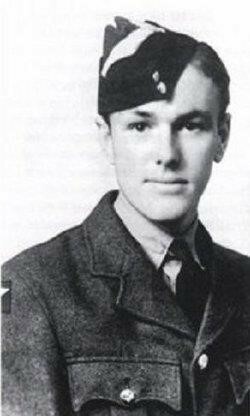 Unable to speak, Flight Sergeant Aaron urged the bomb aimer by signs to take over the controls. Course was then set southwards in an endeavour to fly the crippled bomber, with one engine out of action, to Sicily or North Africa. Flight Sergeant Aaron was assisted to the rear of the aircraft and treated with morphia. After resting for some time he rallied and, mindful of his responsibility as captain of aircraft, insisted on returning to the pilot’s cockpit, where he was lifted into his seat and had his feet placed on the rudder bar. Twice he made determined attempts to take control and hold the aircraft to its course but his weakness was evident and with difficulty he was persuaded to desist. Though in great pain and suffering from exhaustion, he continued to help by writing directions with his left hand. Five hours after leaving the target the petrol began to run low, but soon afterwards the flare path at Bone airfield was sighted. Flight Sergeant Aaron summoned his failing strength to direct the bomb aimer in the hazardous task of landing the damaged aircraft in the darkness with undercarriage retracted. 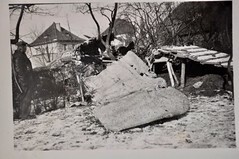 Four attempts were made under his direction; at the fifth Flight Sergeant Aaron was so near to collapsing that he had to be restrained by the crew and the landing was completed by the bomb aimer. Nine hours after landing, Flight Sergeant Aaron died from exhaustion. Had he been content, when grievously wounded, to lie still and conserve his failing strength, he would probably have recovered, but he saw it as his duty to exert himself to the utmost, if necessary with his last breath, to ensure that his aircraft and crew did not fall into enemy hands. In appalling conditions he showed the greatest qualities of courage, determination and leadership and, though wounded and dying, he set an example of devotion to duty which has seldom been equalled and never surpassed. 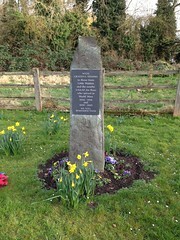 A number of memorials exist in honour of Arthur Aaron. 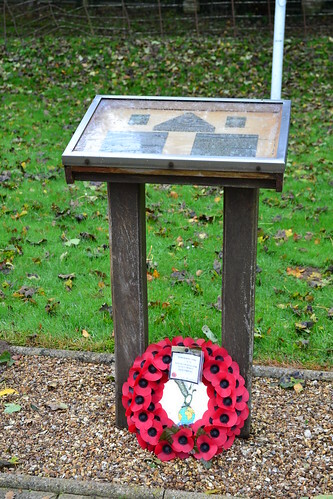 On the site of the former accommodation blocks at Bexwell (RAF Downham Market) stands a small plaque in his honour along side that of Squadron Leader Ian Bazalgette, who also won the V.C. whilst at Downham Market. There is another plaque in the main hall of Roundhay School, Leeds, Aaron’s former school; another commemoration can be found at the AJEX Jewish Military Museum in Hendon, London, and a five-metre bronze sculpture by Graham Ibbeson has been erected on a roundabout to the north of Leeds city centre. Unveiled on 24th March 2001 by the last survivor of the crew, Malcolm Mitchem, it represents the freedom Aaron’s sacrifice helped ensure. The Memorial Plaque at the former RAF Downham Market. RAF Downham Market appears in Trail 7. *1 London Gazette, 15th October 1943, page 4620. No. 218 Gold Coast Squadron, 1936-1945. A blog that has many letters, from Aaron along with the history of 218 Squadron.